Regiment/Service:The Parachute Regiment, A.A.C. 1st Bn. Son of Dr. G. H. Sinclair and Mrs. E. A. Sinclair, of Latheron, Caithness-shire. ReferencePanel 132 to 135 and 162A. 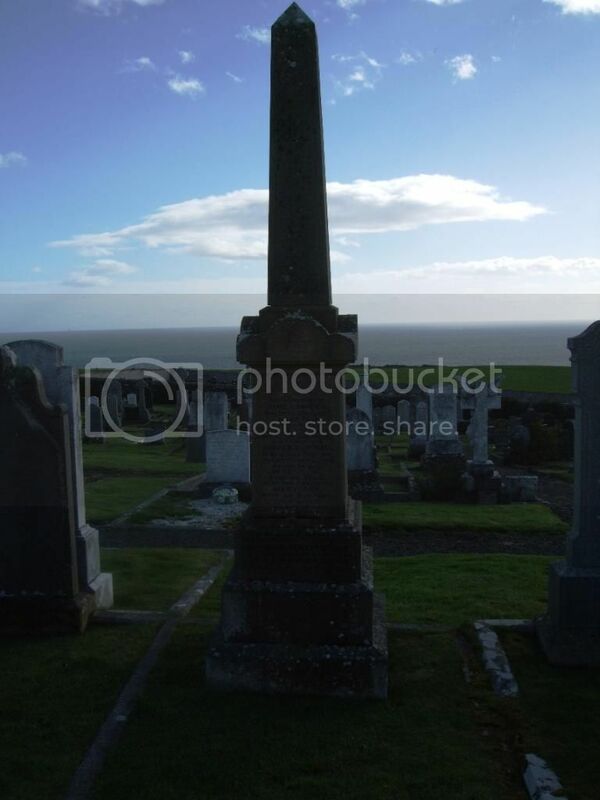 Son of William and Robertina Sinclair, of New Cottage, Achorn Rd., Dunbeath, Caithness. Erected by William Sinclair in loving memory of his parents John Sinclair died 9th October 1888 aged 74. Helen Young died 10th Febuary 1889 aged 77. 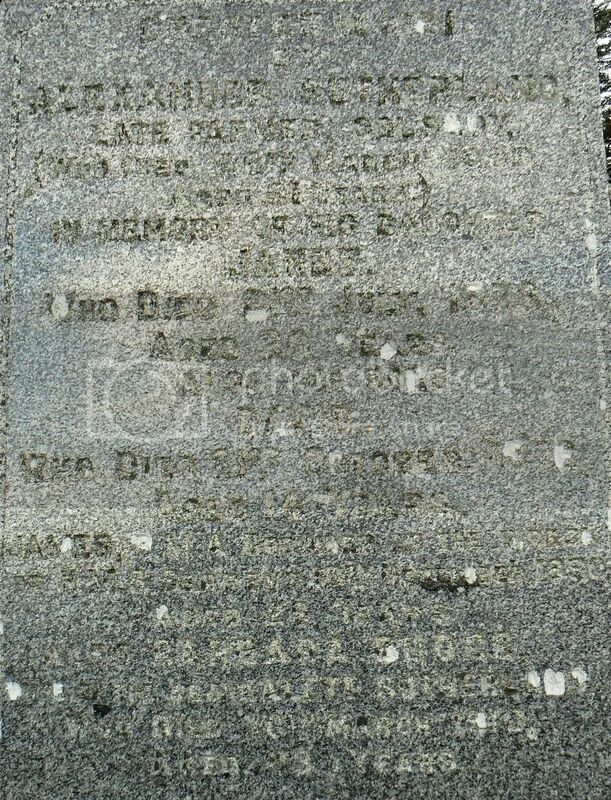 Infant child died 10th March 1884. R M Sinclair 8th Seaforth Highlanders killed at Ypres Belgium 22nd August 1917 aged 27. 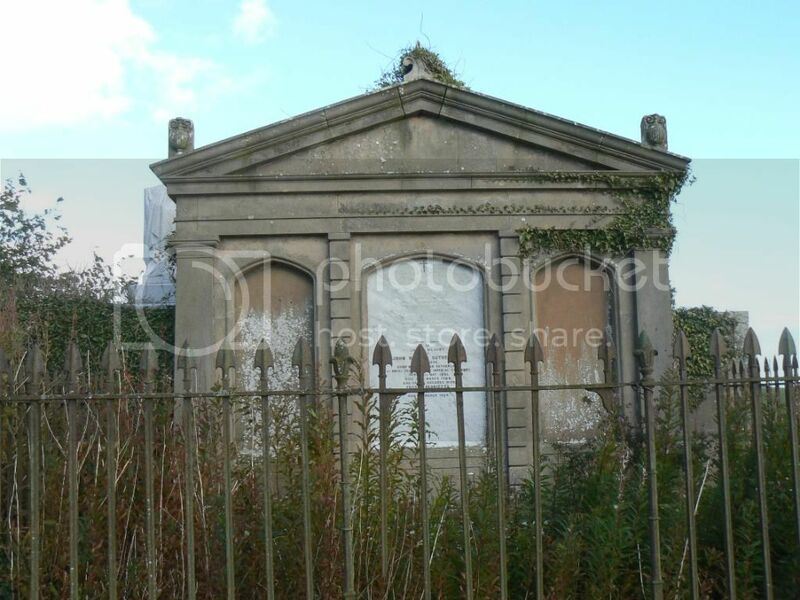 William Y Sinclair died New Cottage Achorn Road Dunbeath 12th July 1923 aged 76.Elizabeth Sinclair died 11th November 1865. Son of Mrs. Annie Sinclair, of Latheron West, Latheron, Caithness, Scotland. Died at Long Nawang. 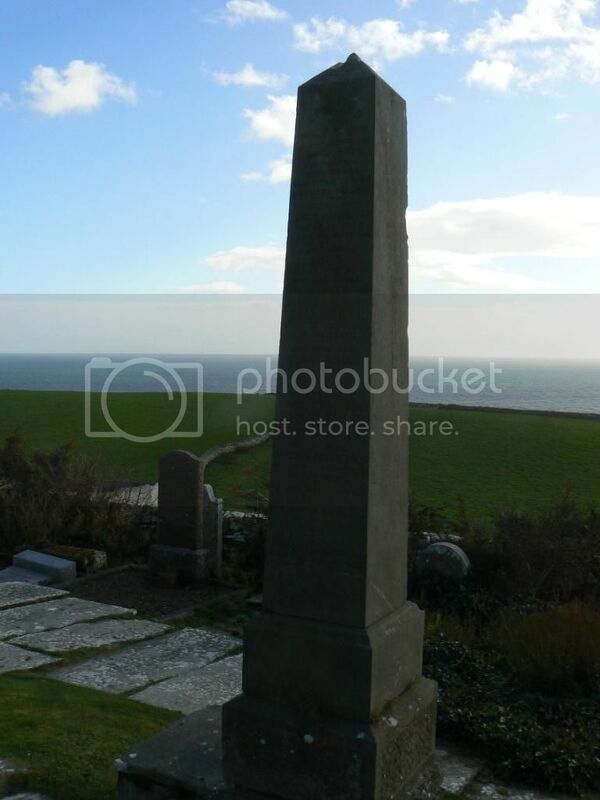 In loving memory of Rachel Young who died 7th November 1896 aged 5 years eldest daughter of John Sinclair, Quoys Forse. 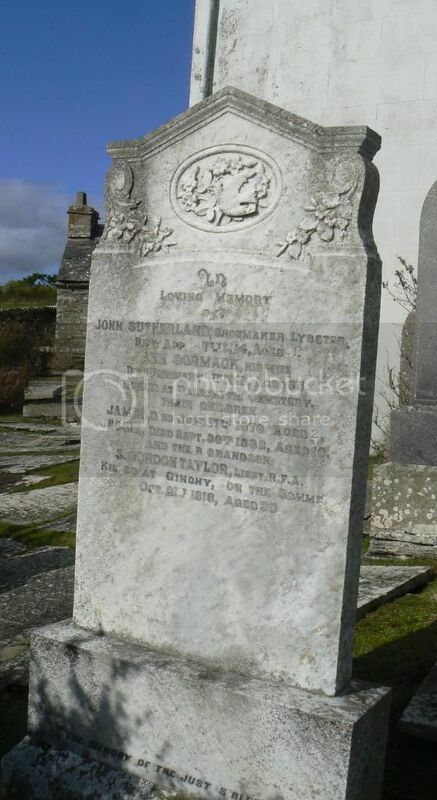 Also the said John Sinclair who died 5th October 1921 aged 65 years. 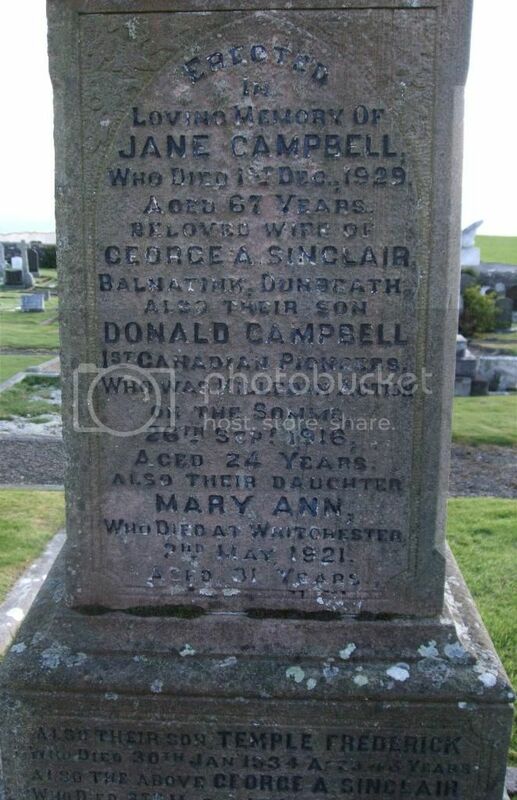 Also their daughter Margaret Campbell died 14th March 1928 aged 33 years. Also their son Robert Finlayson Sinclair died in Japanese hands Borneo 1942 aged 47. 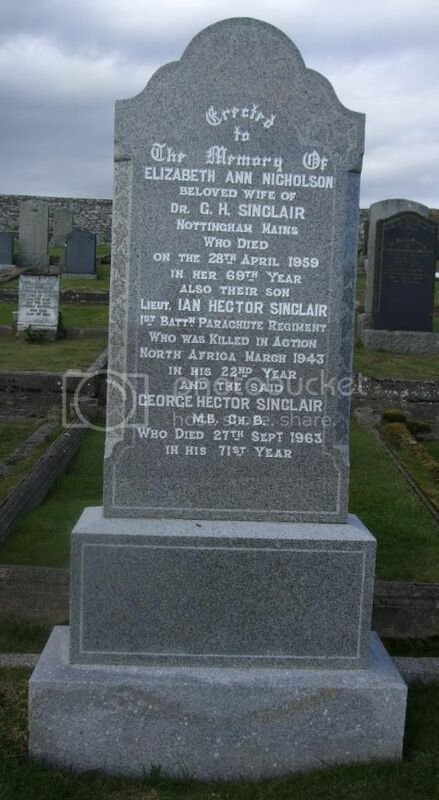 Annie Sinclair wife of the above John Sinclair who died at Latheron West 16th July 1945 aged 83. Son of the late Mr. Peter Sutherland, of Forse, and of Mrs. Sutherland, of Reisgill House, Lybster, Caithness. Regiment/Service:Royal Field Artillery 72nd Bty. 38th Bde. 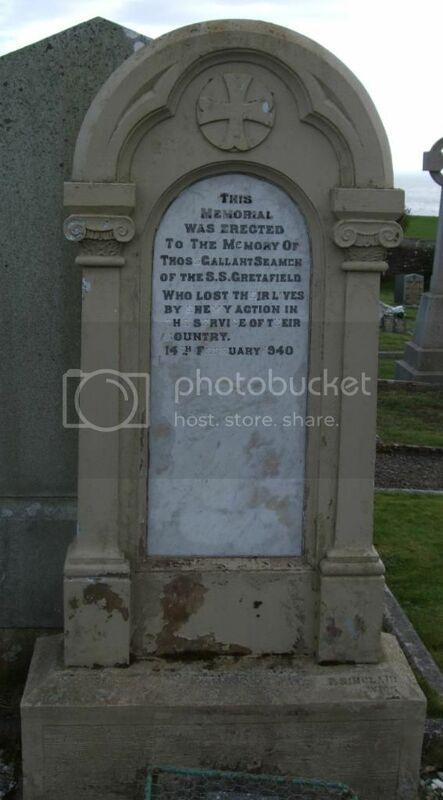 Son of James and Amelia Taylor, of 18, Hillview, Blackhall, Midlothian. Native of Edinburgh. Educated at the Academy and University of Edinburgh. Son of Christina Waters, of Quatre Bras, Lybster, Wick, Caithness, and the late William Waters. This memorial was erected to the memory of those Gallant Seamen of the SS Gretafield who lost their lives by enemy action in the service of their country 14th Feb 1940. Sacred to the memory of John Sutherland Esq. of Forse, late of the 9th Queens Royal Lancers, and of the 56th Regiment of Foot, died Febuary 28th 1846 aged 26.Deeply regretted by a wide circle of friends. This monument is erected as a tribute of affection to a beloved brother by George Sutherland Esq. of Forse. 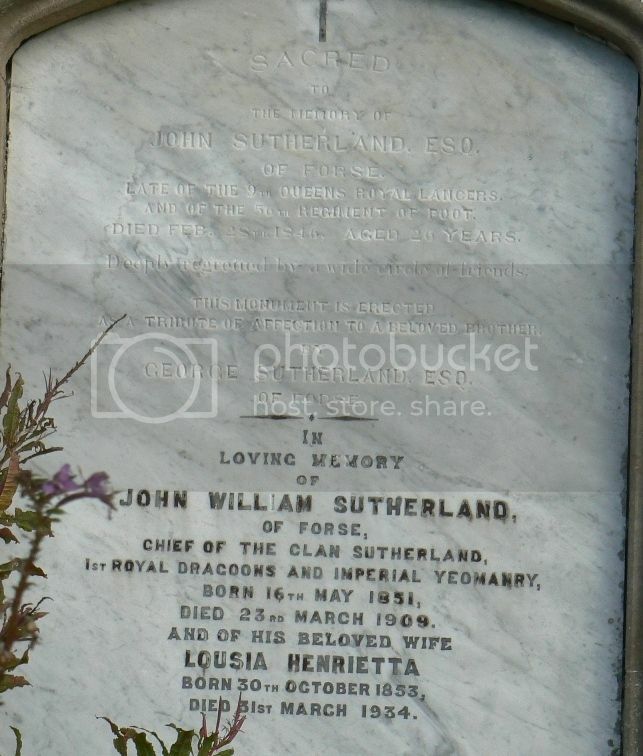 In loving memory of John William Sutherland of Forse, Chief of the clan Sutherland, 1st Royal Dragoons and Imperial Yeomanry, born 16th May 1851 died 23rd March 1909. And his beloved wife Lousia Henrietta born 30th October 1853 died 31st March 1934. I am the resurection and the life he that believeth in me though he were dead yet shall he live and whosoever liveth and believeth in me shall never die believeth thou this. John XI.25.26. 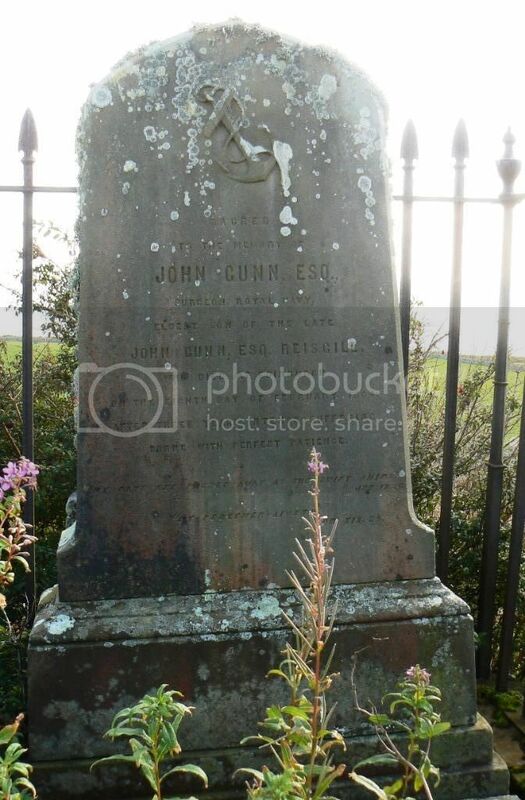 Erected by Jane Sutherland in memory of her husband John Gunn died at Benechielt 14th November 1880 aged 64. Also their son Alexander Gunn, Cpl Coldstream Guards, died 25th April 1880 aged 25. And the above Jane Donn Sutherland died 9th August 1913 aged 93. 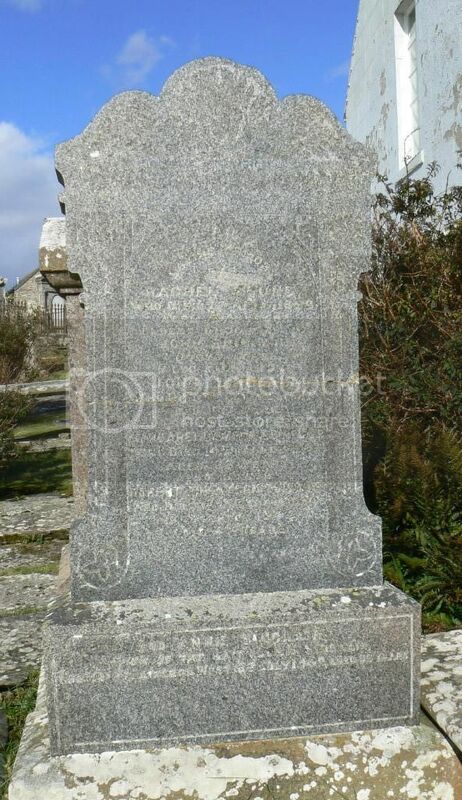 Erected in 1881 by Alexander Sutherland, late Farmer, Golsary, died 26th March 1908 aged 91 In memory of his daughter Janet who died 21st July 1876 aged 20 years. Also his sons David died 21st October 1876 aged 14. 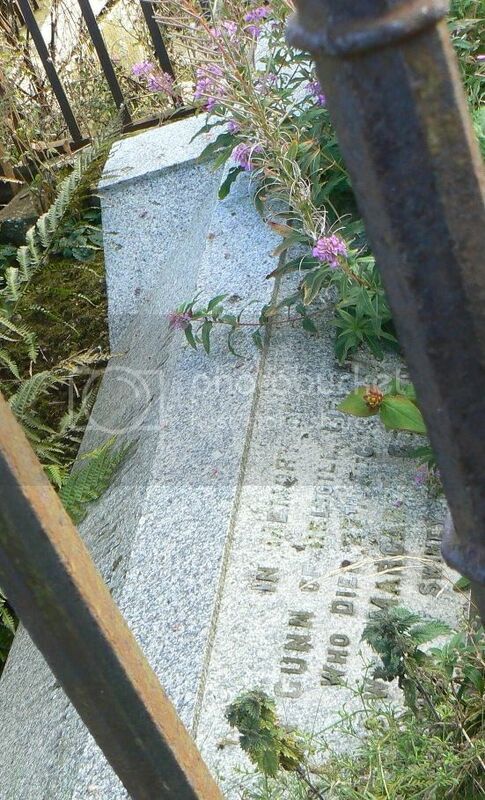 James, RMA drowned at the wreck of HMS Serpent 10th November 1890 aged 26. Also Barbara Budge wife of above Alexr Sutherland who died 10th March 1910 aged 83 years. Sacred to the memory of John Gunn Esq, Surgeon, RN, eldest son late John Gunn of Reisgill, died at Edinburgh 8th Febuary 1864 after 3 years intense suffering born with perfect patience, My days are passed away as swift ships Job XIX 26. My redeemer liveth Job XIX 25.
who died 8th November 1890. 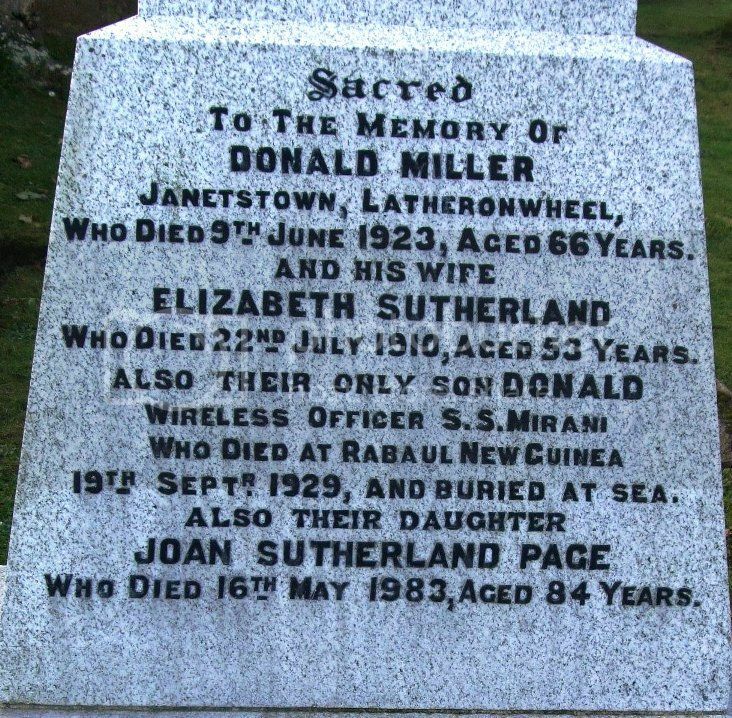 Sacred to the memory of Donald Miller, Janetstown, Latheronwheel who died 9th June 1923 aged 66 years. 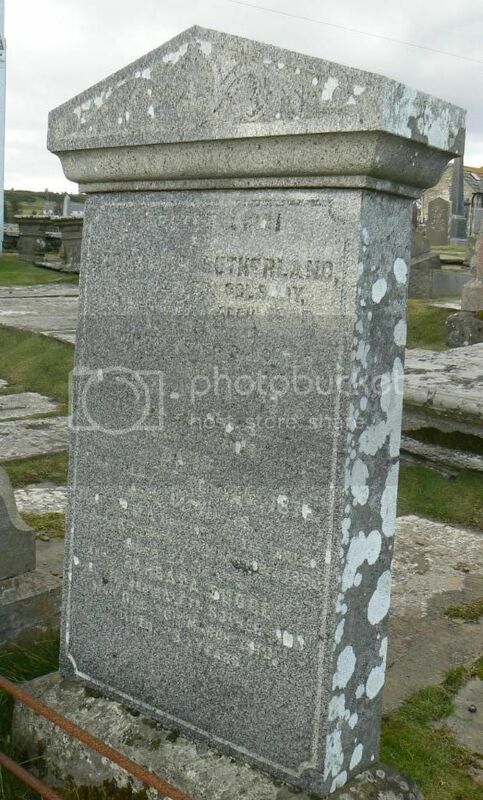 And his wife Elizabeth Sutherland who died 22nd July 1910 aged 53 years. Also their only son Donald, Wireless Officer, SS Mirani who died at Rabaul, New Guinea 19th September 1929 and buried at sea. Also their daughter Joan Sutherland Page who died 16th May 1983 aged 84 years. 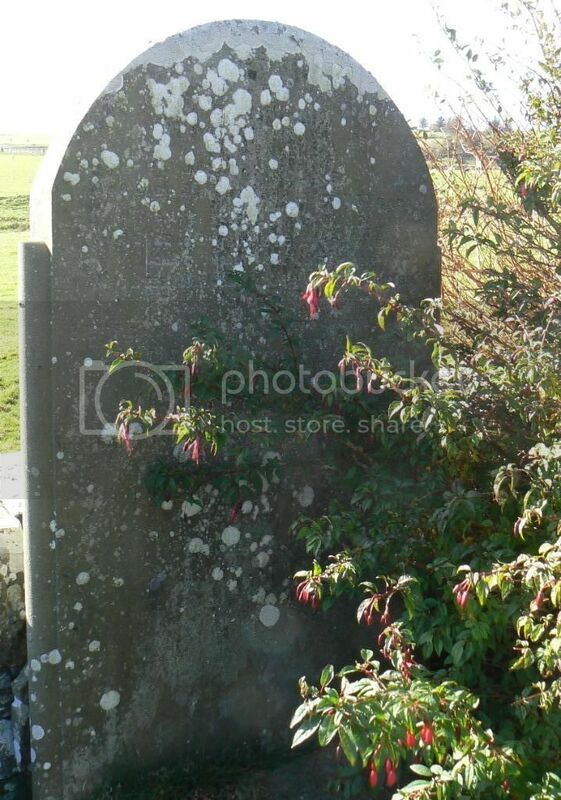 Erected by W and J Cooper in memory of William Cooper, late Farmer, Knockinnon, died 8th August 1836 aged 90. 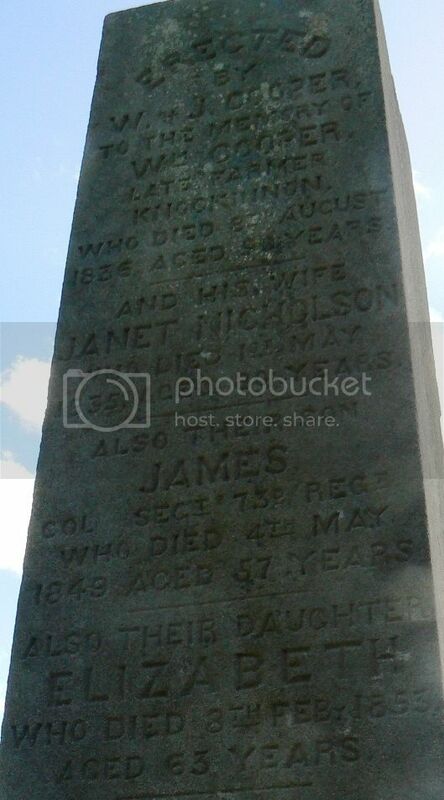 His wife Janet Nicholson died 1st May 1835 aged 80. 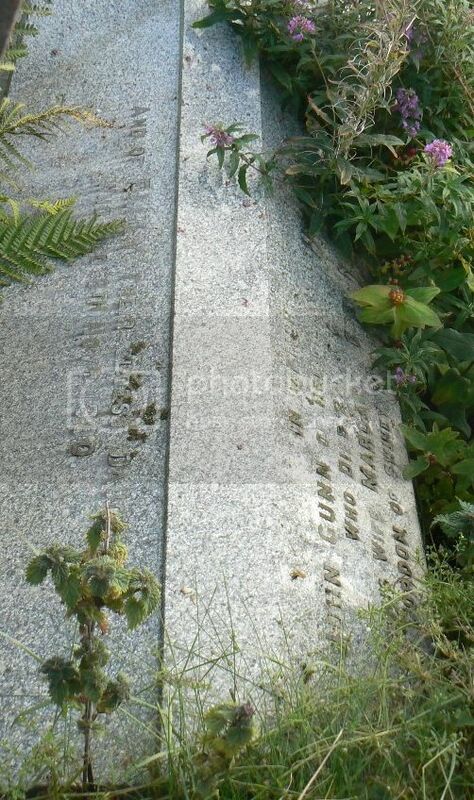 Also their son James, Col Sgt 73rd Regt, died 4th May 1849 aged 57. Also their daughter Elizabeth who died 8th Febuary 1853 aged 63. Also their sons John & Donald died in New Zealand. 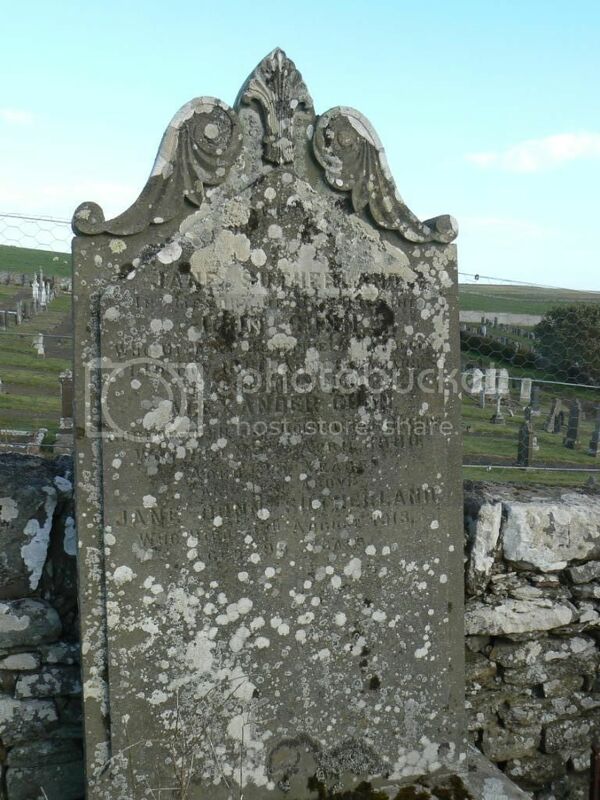 Also their son Alexander Cooper, late Farmer, Knockinnon who died 19th December 1867 aged 84 and his wife Barbara Henderson who died 1st August 1858 aged 77. 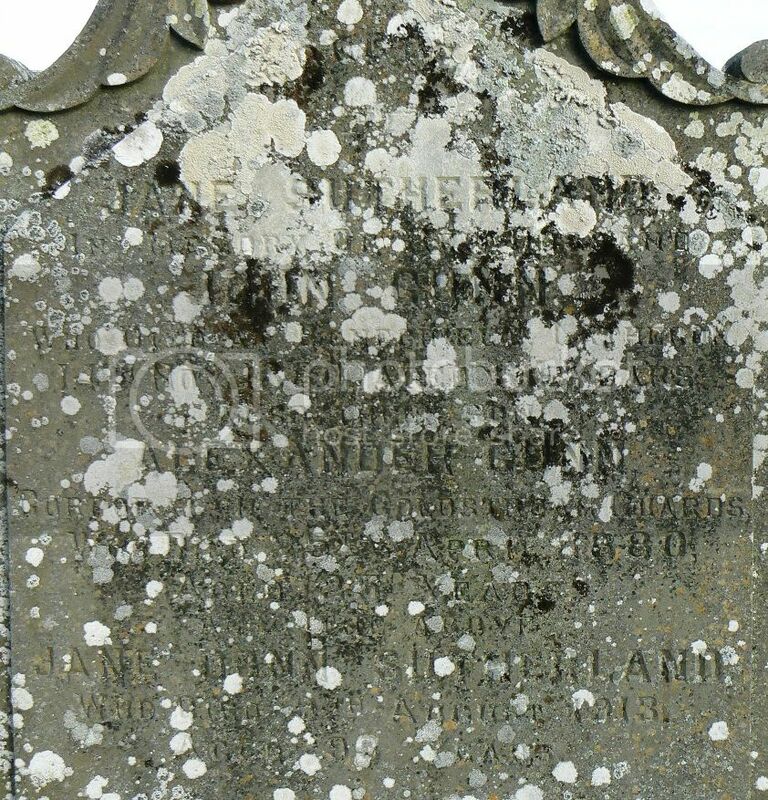 And their son James who died in California on 6th September 1857 aged 33.